Right Photo: William Dusenberry. 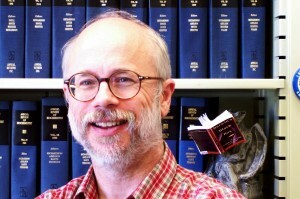 Left Photo: William van Druten. Two atheists active with their FFRF chapters who are former Boy Scouts have had it with Boy Scouts of America. They are encouraging other former Boy Scouts to speak out, return medals to BSA or otherwise protest BSA bigotry. 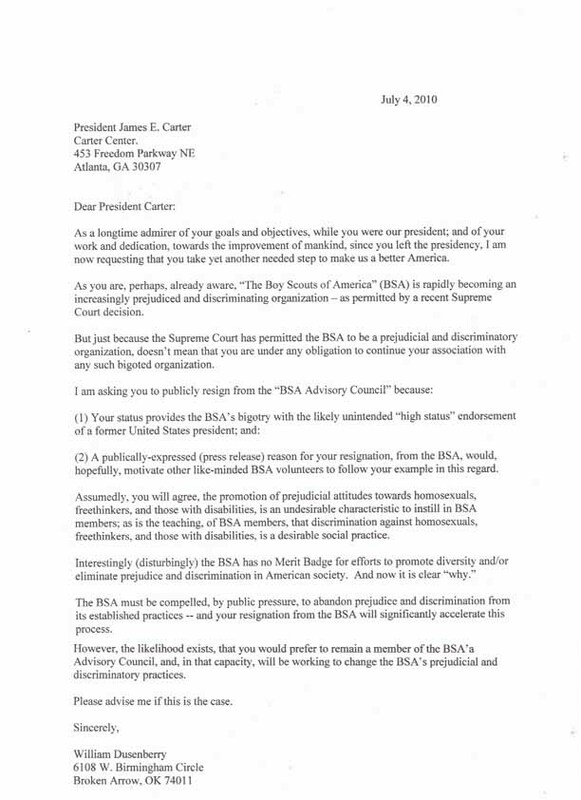 William Dusenberry, a retired professor who helped found FFRF’s Tulsa chapter, is sending his BSA shirt and three merit badges, “none for bigotry,” to Jimmy Carter, a member of the BSA Advisory Council. He sent a letter on July 4 asking Carter to publicly resign. He encourages all former Boy Scouts who are nontheists or who are disgusted by BSA’s most recent repudiation of gay members, to do likewise. Dusenberry says he’s “miraculously” kept the BSA paraphernalia with him through moves in seven states. He was “the only non-Roman Catholic in my troop. I had to stand quietly while the opening ‘Holy Marys’ were recited,” he recalls. William van Druten, M.D., who founded Lake Superior Freethinkers, a chapter of FFRF in Duluth, Minn., was part of Troop 88, San Francisco. He sent a photo of himself to BSA pictured with his Eagle Scout medal and the words “ashamed.” Van Druten called BSA’s stance against nonbelieving members and its recent decision to reaffirm its stance against gay membership “a gross disgrace.” For van Druten, it will not be “once an Eagle, always an Eagle” after BSA‘s reaffirmation to ban openly gay members. The discrimination against nontheists is apparently so entrenched BSA didn’t even bother to reaffirm it. “All of my fond memories are somehow tainted by the decision of the BSA to exclude a part of our society that has suffered enough discrimination over the decades. FFRF is creating a “Badge of Shame on BSA” webpage to house photographs of FFRF members with their rejected BSA paraphernalia, etc. Send large JPEG photos with identification, etc., or other responses to: FFRF News. The Appignani Humanist Legal Center has filed an amicus curiae brief on behalf of the American Humanist Association and other allied organizations with the Supreme Court of the United States. The Court is hearing an appeal of a case that turns on the question of whether religious organizations have a constitutional right to discriminate on the basis of race, gender, age or disability in violation of employment laws. The special religious exemption at issue in this case, called the “ministerial exception” by those lower courts that have adopted it, has never been considered by the Supreme Court. The right of religious employers, such as churches and related institutions, to require that employees to be of the same religion as their employer is not at issue in this case. The amicus brief argues that recognizing the ministerial exception would place religious institutions above the law, unjustly denying to their employees their day in court when they have been subject to illegal discrimination by their employer. The brief also argues that courts themselves violate the Equal Protection Clause of the Fourteenth Amendment, which guarantees equal protection of the laws to all, when they act to throw out an employment discrimination case against a religious institution because in so doing they become complicit in the employer’s discrimination by denying its victim any legal remedy. “Our courts should have no role in protecting illegal discriminatory conduct. Their purpose instead is to act as a fair, secular tribunal to determine whether an employee has had his or her legal rights violated and to provide the justice due if they have been,” said Burgess. Arguments in the case, Hosanna-Tabor Evangelical Lutheran Church and School v. Equal Employment Opportunity Commission, will be heard by the Supreme Court in early October. Proposals from the Church of England to reduce religious discrimination in school admissions is welcome but does not go far enough, the British Humanist Association has stated. The BHA was responding to comments from the Rt Revd John Pritchard, Bishop of Oxford, who said that admissions policies favouring religious children should be changed, limiting discrimination to 10% of admissions from the current permission to discriminate on all places. An unintended consequence of the coalition government’s decision to permit “free” schools to be set up in England and Wales is that the teaching of creationism and Intelligent Design (“ID”) is once again in the public eye. The Department of Education recently made clear that teaching ID in science class is prohibited on the grounds that it is unscientific. However this prohibition will not apply to free schools. Why does the DoE believe that ID is unscientific? ID concludes that some biological systems (such as the blood-clotting and immune systems) are so complex that Darwinian evolution cannot explain them; instead an “intelligent designer” must have been responsible. For many scientists it is outside the role of science to rely on a supernatural intelligent designer. 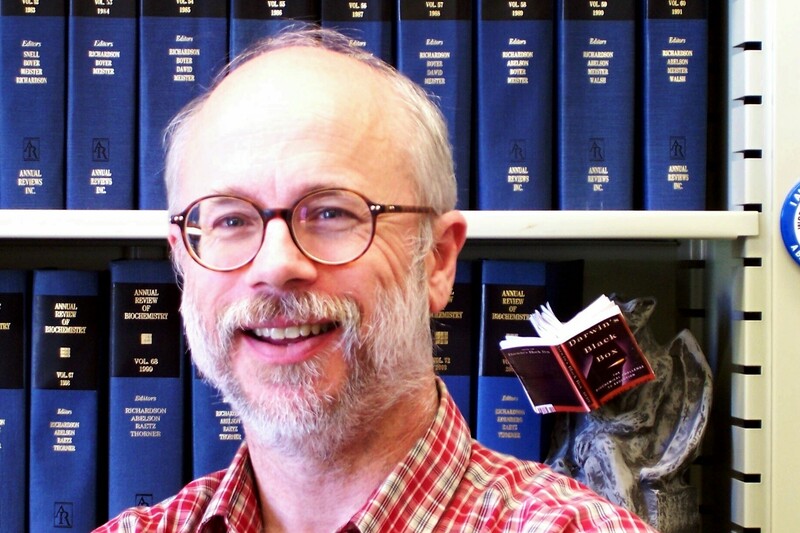 Dr Michael Behe is the biologist whose theory of Irreducible Complexity forms the so-called scientific basis of ID. He told me that during the many years in which he has worked as a biologist, no one ever asked him about the definition of science. He continued, “The only time the definition of science comes up is when you discuss matters like this. Philosophers have been trying to define science for a number of years and they’ve given up, so far as I understand. That’s because they can’t find a definition which excludes what they want to exclude and includes what they want to include.” Behe went on to claim that even Isaac Newton’s law of gravity was originally believed to be unscientific, as was the Big Bang theory when it was first proposed. According to Behe, the definition of science should not restrain an investigation of nature, or it will not serve a useful purpose. He offers a definition of science sufficiently loose to embrace his theory of Irreducible Complexity: “. . . just using physical evidence and reasoning to come to a conclusion about nature.” Yet, as he was forced to admit under oath in the infamous Pennsylvanian court case Kitzmiller v. Dover Area Schools Board, even astrology would fall within his definition. Fuller went on to tell me that he personally experienced a version of this. 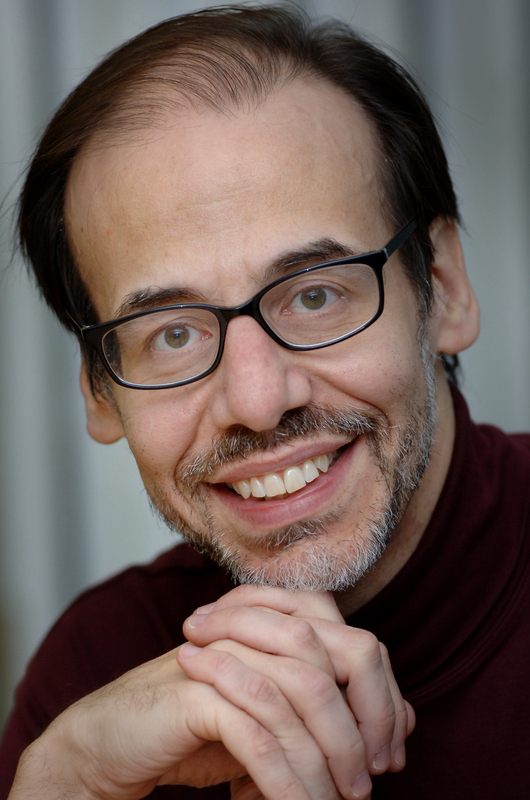 Steve Fuller says he has been discriminated against for promoting Intelligent Design. Michael Reiss, Professor of Science Education at the Institute of Education, London, accepts that it is difficult for someone advocating ID to get funding from a scientific establishment. “It’s like homeopathy – your average scientific funder will think that this is just a waste of money.” However he pointed out that charities will sometimes fund this kind of research. The possible problem with that approach is that without the support of rigorous science (as opposed to pseudo-science), many scientists will surely continue to regard ID as, at best, wrong – and at worst, wrong and unscientific. Similarly Behe is heartened by the situation in Britain. Towards the end of 2010 he gave a lecture tour of Britain. He accepts that “people often use teaching ID in schools to children as some kind of bogeyman to scare people away, saying that somebody will be indoctrinating your child.” But he believes that there is more tolerance in discussing issues concerning religion in Britain than there is in even America. But that’s not so much a debate about Origins, as a debate about the future. Note: “Free” schools are taxpayer-funded schools “set up in response to what local people say they want and need in order to improve education for children in their community”. This includes religious schools. Learn more about free schools here. Humanists have welcomed a new policy approved at the Liberal Democrat Spring conference which commits the Party to ensuring that religious organisations which provide public services may not discriminate in their employment or against service users on religious grounds in the provision of those services. c) Ensuring that public services are delivered without unjustified discrimination against service-users or employees, by amending equalities legislation to narrow the exemption granted to organisations with a religious ethos , and in the interim requiring public sector commissioners to include non-discrimination clauses in their contracts with providers. Peter Kunzmann, chair of the Humanist and Secular Liberal Democrats (HSLD), spoke when the motion was being debated in favour of the clause, and urged delegates to welcome its inclusion in the motion. BHA Head of Public Affairs Naomi Phillips commented: ‘It is the BHA’s firm position that religious organisations which are providing public services on behalf of the state – a policy the government is actively encouraging – should be held to the same equality standards as any other private or state provider. That means that such organisations must not be permitted, as they are at present, to discriminate on religious grounds against employees and service users. Such discrimination is unjustified, unnecessary and wrong. Mr Kunzmann said: ‘Public services should be available to everyone who needs them – whatever their beliefs. The BHA works with groups across the political spectrum and the Labour Humanists, HSLD and the Conservative Humanist Association (CHA) are all affiliated to the BHA < http://www.humanism.org.uk/meet-up/groups/political-special-interest>. Your home for rational media coverage.